News > Psychopathic News > Last Chance to buy Morton’s List! 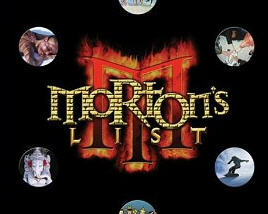 Last Chance to buy Morton’s List! Sales of single Morton’s List box sets will end at midnight, October 31st and no longer be available at Amazon.com.Cases of Morton’s Lists will be sold at MortonsList.com until December 17th, through the List Keepers program. As Morton’s List comes full circle, a new chapter begins where the last left off. Morton’s List will live on in digital forms, while the Random Reality “engine” that drove it seeks a new, even more powerful expression. What comes next will continue the mission of Morton’s List, showing people the endless possibilities for enjoying their lives and expanding consciousness. Karma Always. I’m not sure how long this message has been up, but I wanted to give you a fair warning about it before you lose your chance to own a physical copy of Morton’s List forever! It looks like it’s actually out of stock at Amazon.com, so wholesale may be the only way to get it! We’ll keep you posted on further details!